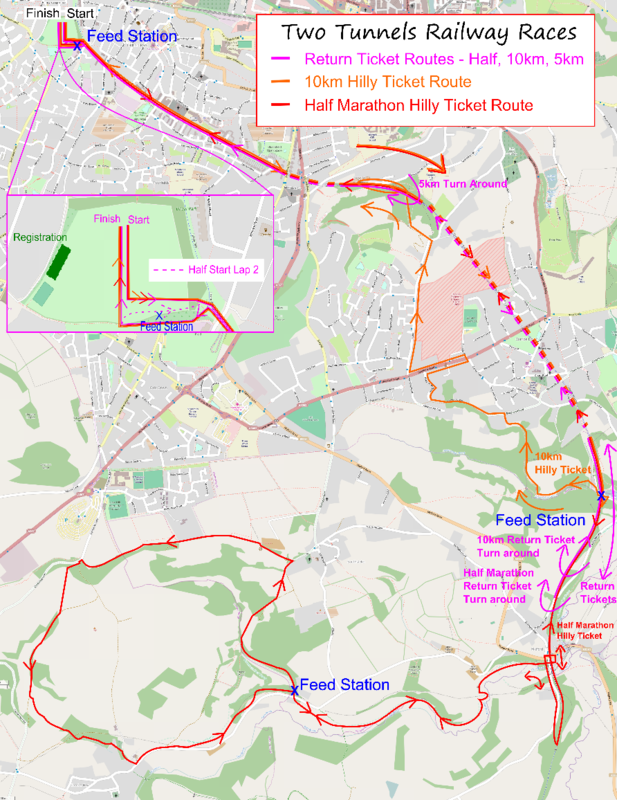 There are 3 different half marathon routes, known as Return Ticket, Hilly Ticket and City Ticket, being run through the Two Tunnels this year, please scroll down to find the course details for the date you are looking at racing. 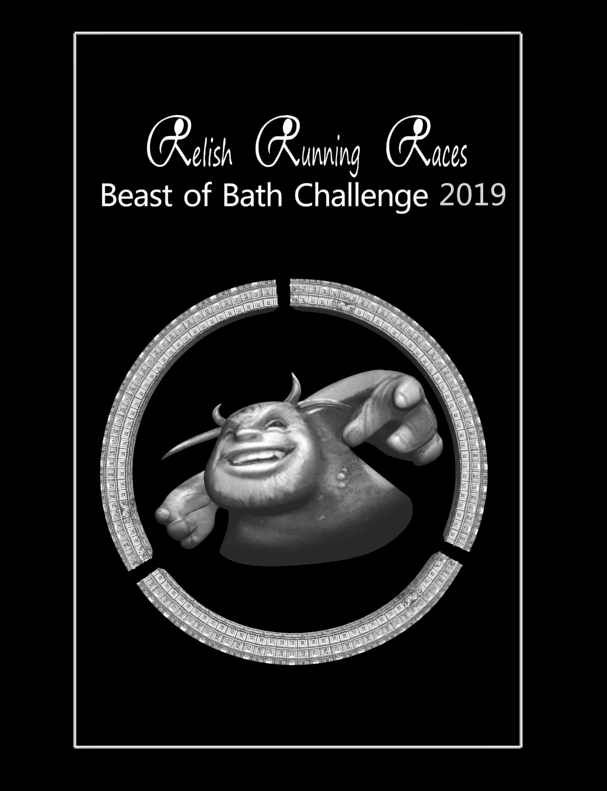 All the Half Marathon distance events are also part of our Challenge Series events; The Two Tunnels Challenge and Mini Challenge as well as the Beast of Bath Challenge, scroll to the bottom of the page for full details. The first mile of the course is on the Two Tunnels Greenway shared path along Linear Park. It is on a slight incline up to Devonshire Tunnel which is the first of the Two Tunnels. Devonshire tunnel is 408m long and is well lit. The course gently curves round to the left through the tunnel. Next runners emerge in Lyncombe Vale and run along the elevated embankment through a very pretty wooded area. After 1km of running along the top of the embankment it is time to enter Combe Down Tunnel which is 1672m long making this the foot race with the longest underground section in Britain! The Northern side of Combe Down tunnel is 50ft higher than the Southern portal which ensures a cool breeze circulates through the tunnels. The tunnels themselves are lined with a combination of bricks and the exposed limestone rock through which the tunnels were originally bored. Upon exiting Combe Down Tunnel runners head over Tucking Mill viaduct where there will be a drinks station. Shortly after the drinks station runners will retrace their steps back through the Combe Down and Odd Down Tunnels. When runners return to the Brickfields site you will need to turn right to start your 2nd lap and merge with 10km runners heading out on to the course to complete a loop of the course again. When returning to Brickfields for a 2nd time you will need to turn left and head directly to the finish line. The 1 lap Up & Over Half Marathon is actually NOT that hilly! We just needed a name to differentiate it from the flat and fast 'Return Ticket', and went with Hilly, though Trail would probably have been more accurate. There is only one good hill on the whole course! This route has beautiful hill top views and takes in even more history of the Somerset & Dorset Railway era by following the routes of the railway lines and the Somerset Coal Canal. The first 3 miles of this route and flat and fast and follow the line of the Somerset & Dorset Railway. Runners will pass through the Two Tunnels, the first tunnel after approximately 1 mile which is 408m long the second longer tunnel another mile later. Runners will emerge from the tunnel on Tucking Mill viaduct where runners can grab a welcome drink. Runners of the up and over Half Marathon will carry straight ahead at this point (not turning where the Out & Back Half Marathon does) towards the remaining platform of Midford Station of the Somerset & Dorset Railway. Ahead is a small pub car park, please be careful when crossing the car park (approx 25m long) and keep to the marked footpath shown on the tarmac. After another 200m runners will leave the line of the Somerset & Dorset Railway and make a 180 degree turn to the right and join the road running parallel to the track. Please keep tight to the right hand side when running on this short section of the road. 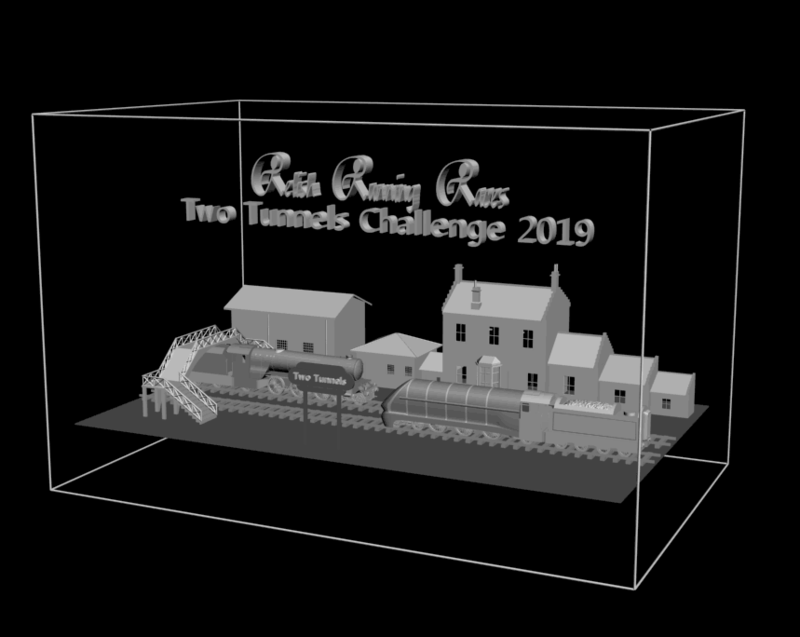 Runners will then loop around and under the viaduct holding the pub car park and join the line of the Somerset Coal Canal. The Somerset Coal Canal operated from 1805 - 1898 when it delivered coal from the North Somerset Coalfields onto the Kennet & Avon Canal and from there into surrounding cities and towns. It delivered 100,000 tons of coal a year and was the most succcesful canal of it's kind in the country. The speedy service offered by the railway put the canal network under strain and lead to the closure of the canal in 1898. The railway lines often capitalised on the closure by building new lines over the top of the old canal routes as they offered level routes across the countryside with bridges and tunnels already in place. The Somerset and Coal canal was replaced by the Camerton to Limpley Stoke Railway which built by Great Western Railway in 1910 before closing itself in 1951. 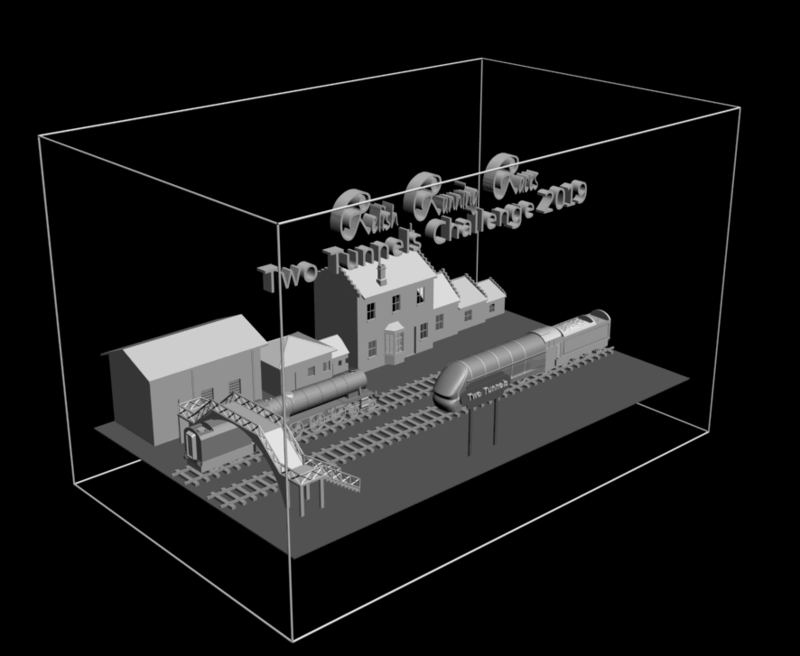 As the relationship between Canal and Railway is so well entwined there are many features of both throughout this route. The first features of the canal and railway reveal themselves straight away; on your right hand side is the old canal bed and the Midford Aquaduct on the left hand side which connected the Radstock and Dunketon Line of the Somerset Coal Canal. As you loop around you will go under an impressive viaduct of the Camerton & Limpley Stoke Railway. There a few flat miles ahead where runner will follow the line of the canal on their right hand side. Ahead is a road crossing and a Feed Station which marks the start of the hilly loop. The feed station itself is under the a viaduct of the Railway line and in the bed of the canal. After passing through the Feed Station you will see the start of a flight of 21 locks through Engine Wood which raised canal boats up and over the hill to Combe Hay. Runners will now turn off the canal path (which now goes through private land) and climb up the hill to South Stoke and great views from the top of the hills. The next mile of the course is flat and follows the ridge along the top of the hill and around the back of the Odd Down Park & Ride where many of you may have parked to get to the event. A nice down hill section brings you back down into Combe Hay village and runners will pass under a culvert (small tunnel) under the line of the railway. When you emerge in the village stick the left hand side as you follow the country roads back to the line of the railway line. Here you will follow the trackbed back to the Feed Station under the viaduct and in the bed of the canal. From here runners retrace their steps back to Midford and the Somerset Railway Line towards the Tucking Mill Feed Station. From here runners trace their steps back to Brickfields Park following the same route as the other events. 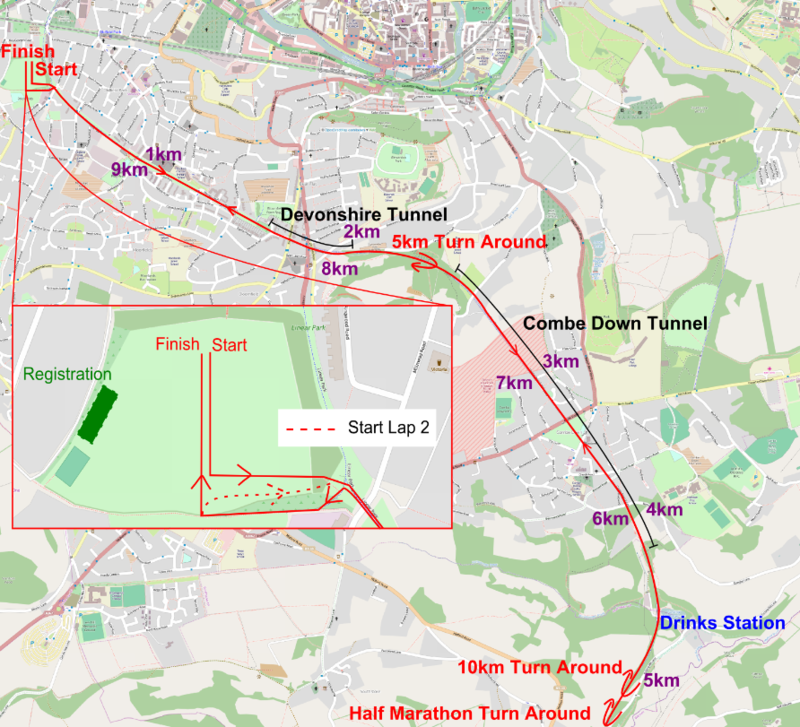 The 1 lap looped Two Tunnels Half Marathon course takes in the the best of the countryside views along the Limpley Stoke Valley as well as beautiful city centre running through the heart of Bath along the footpaths and riverside trails. Upon exiting Combe Down Tunnel runners head over Tucking Mill viaduct. Runners turn left after crossing the viaduct and towards the steps to Tucking Mill reservoir. Following the public footpath leads runners onto Tucking Mill Lane past the house of the world renowned Geologist William Smith who produced the first Geologiclal Map of the country. Tucking Mill Lane is not being closed by the race so there may well be traffic along this section. Please be careful, stick to the left hand side of the road, and follow the direction of the marshals. The roads wind through the pretty village of Monkton Combe following the National Cycle Network Signs. The route runs alongside Monkton Combe School (please stick to the correct public footpaths) and onto a lane which was a track bed of the Bristol and North Somerset Railway which met the Somerset and Dorset Line (the line through the Two Tunnels) in Midford with the Bristol and North Somerset Railway line passing beneath the Somerset and Dorset Line and each line having it's own station. The route now crosses into the car park for the Dundas and Canal Company and it is here where we are positioning out second Feed Station. This car park will be in use by visitors to the canal and National Cycle Network routes so please be careful and follow the instruction of the marshals. The footpath from here runs alongside the sole remaining spur of the Somerset Coal Canal. This canal served Bath with coal from nearby North Somerset Collieries before it was bought out by the Great Western Railway Company who built the aforementioned Bristol and North Somerset Railway over the line of the canal as a speedier way of transporting coal into Bath. The Somerset Coal Canal quickly merges with the Kennet & Avon Canal at the beautiful Dundas Aquaduct which is over 200 years old. If you look to your right after the second Feed Station you will be able to see the Aquaduct through the trees. Once on the Kennet & Avon canal the route contours around the hills of Bath through the beautiful Limply Stoke valley. Keep an eye for great sites along the way; Warleigh Weir and Warleigh Manor and Brown's Folly up on the hill top on the right hand side. The 3rd Feed Station is on the approach to Bathampton just before the stone hump back bridge (near the turning point of the Long Half Marathon and Marathon of the Bath Running Festival routes). The race runs back into Bath through Sydney Gardens with ornate bridges running over the canal. The canal passes underneath Cleveland House, where canal boats used to pass their toll payment through a hole in the roof of the tunnel. There are a couple of road crossings as the canal descends into Bath to merge with the river Avon. Runners cross over the canal using the bridge over the Lock Gate, the 2nd deepest Lock in the country! (if it is in use we can cross the road - it is a little too far to jump ;-)). Shortly after the canal and river meet and the runners head right along the river bank into the heart of Bath for the 4th Feed Station. The feed station is right on the river, by the world famous Pulteney Bridge and Weir. With Bath Abbey over looking this spot, it may be tough for runners to leave this prettiest of Feet Station stops. The next few miles are along the river Avon heading pass old warehouses with original crane houses still intact. The route goes under the original railway line of Green Park Station, the terminus of the railway line, which now hosts a variety of small businesses. As the route heads out of Bath there is one final river crossing to complete the loop back into Linear Park and rejoin the route of the Somerset and Dorset Railway. There is a crossing of a potentially busy road. Please use the zebra crossing and follow the instructions of the marshals. Through a couple of streets and the route rejoins the Two Tunnels route in Linear Park. The route then goes back under the start point at Claude Avenue Bridge and towards Devonshire Tunnel. Half Marathon and Marathon runners turn off the Two Tunnels path and run along the streets of Ringwood Road and Millmead Road before entering the Brickfields site and turning left to the finish line ahead. Marathon runners will turn right at the end of the first lap once they enter the Brickfields site and merge with 10km runners who are heading out on to the course. Marathon runners turn left on their second lap and head to the finish line. 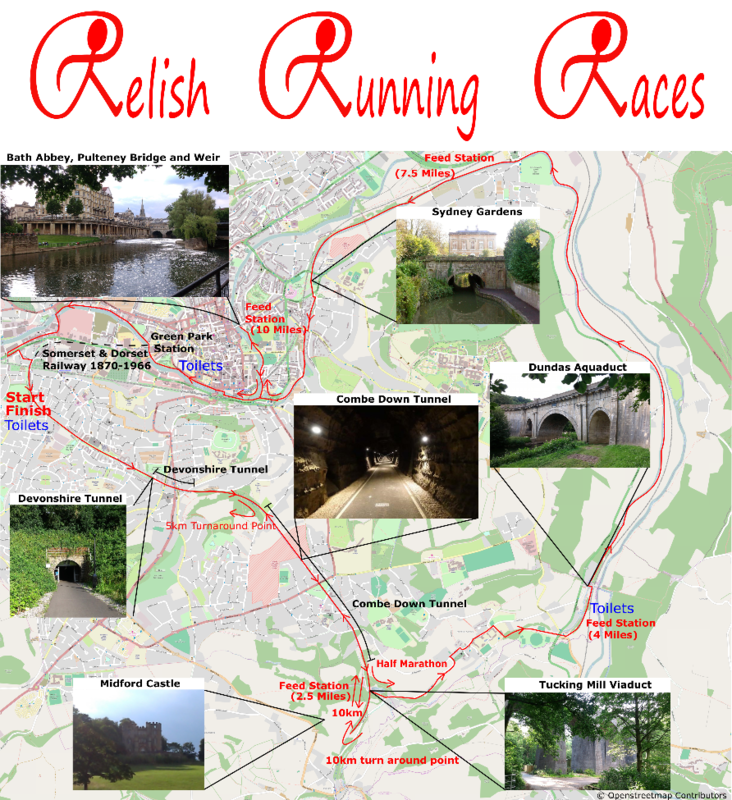 The Half Marathon races also form part of the Two Tunnels Challenge and Beast of Bath Challenge series events. All runners who complete the Mini Challenge or Challenge will be awarded with a special laser engraved glass trophy to mark their achievement. Plus the 3 medals from the 3 individual races. Trophies shown below. Two Tunnels Mini Challenge; Two Tunnels 5km + Two Tunnels 10km + Two Tunnels Half. You can run any distance on any date, the distances do not have to be sequential and you can run the 5km and 10km on a single day if you like! Two Tunnels Challenge; Two Tunnels 10km + Two Tunnels Half + Two Tunnels Marathon. You can run the 10km and half marathon on any date, the marathon is run on 18th August.